We have been treated to a menagerie of echinoderms during several of the dives of the Mountains in the Deep: Exploring the Central Pacific Basin expedition. By far the most lovable class of this phylum was the Holothuroidea, commonly known as sea cucumbers. It is hard to believe that these jelly-like blobs are closely related to sea stars (asteroids), brittle stars (ophiuroids), feather stars and sea lilies (crinoids), and sea urchins (echinoids) – but they are! This holothurian, in the family Laetmogonidae, was found on Dive 02 of the Mountains in the Deep: Exploring the Central Pacific Basin expedition, at 2,495 meters (8,185 feet) depth. 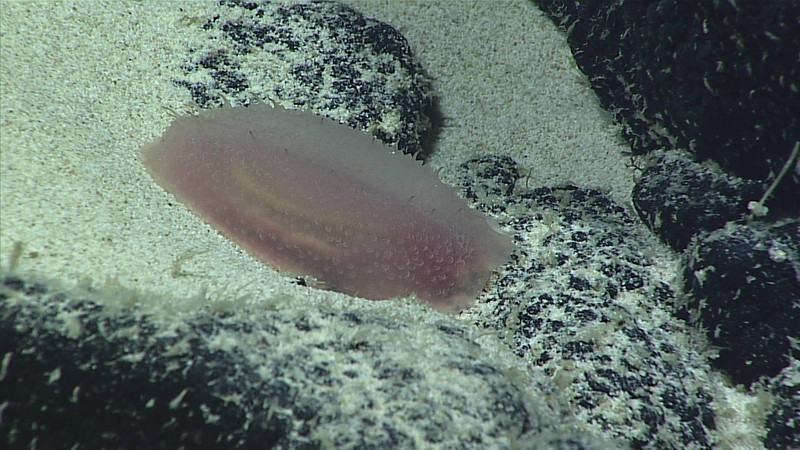 Notice the gut full of yellow sediment visible through its elongated translucent purple body. Image courtesy of the NOAA Office of Ocean Exploration and Research, Mountains in the Deep: Exploring the Central Pacific Basin. Download larger version (jpg, 837 KB). Holothurians were not what we were expecting to see on Dive 02 – at the ridge of a seamount – as they are the vacuum cleaners of the deep ocean; watching them eat is seeing bioturbation (the movement of sediment particles by animals, a key ecosystem process in the deep ocean) in action. Their feeding mode is known as deposit feeding: they eat their way along the seafloor, separating the organic matter from the inedible, and then excreting the inorganic sediment. This requires them to have access to sediment, which isn't always the case on ridges mostly covered in rock and lacking in soft sediment, as we have seen on many of the dives. We have been lucky to see a quite diverse range of holothurians, with few of them being species that I was familiar with! The first holothurian of the expedition, an individual with a gut full of yellow sediment visible through its elongated translucent purple body, is likely from the family Laetmogonidae (pictured above). This species has long thin dorsal papillae (nubs, bumps, or extensions) evenly distributed in two rows, with many short tube feet along the whole underside of the body. 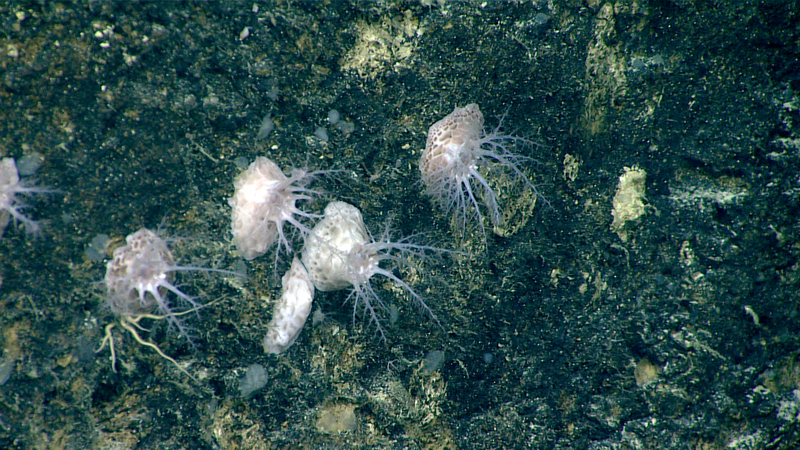 Three of the holothurians spotted by the remotely operated vehicle Deep Discoverer (pictured below) looked more similar to each other than to the first. They appeared more rounded but with a rougher texture. Their colors were also similar, all being a shade of pink. These species had long, thin, sparse dorsal papillae and it was possible to spot the tube feet (or podia) used for getting around peeking out from under them. These three pink species could be from the family Synallactidae with some experts participating in the dive remarking that they looked very similar to the genus Bathyplotes. 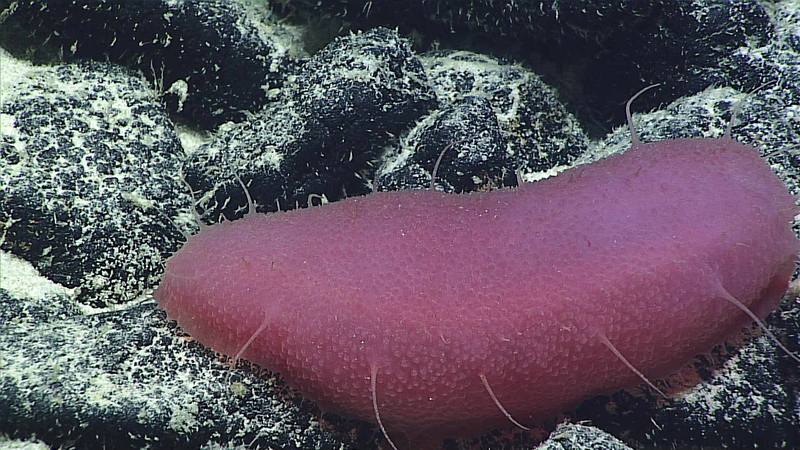 This light pink holothurian, which could be from the family Synallactidae and possibly genus Bathyplotes, was found at a depth of 2,480 meters (8,136 feet) on Dive 02 of the expedition. Image courtesy of the NOAA Office of Ocean Exploration and Research, Mountains in the Deep: Exploring the Central Pacific Basin. Download larger version (jpg, 1.1 MB). 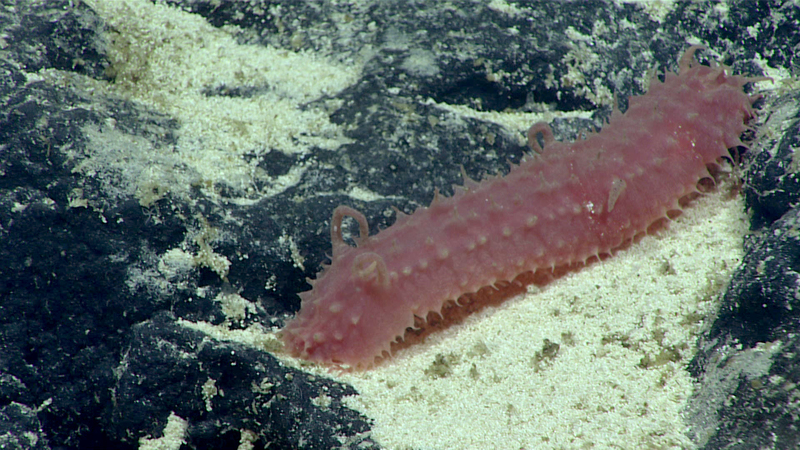 This bright pink holothurian, which could be from the family Synallactidae and possibly genus Bathyplotes, was found at a depth of 2,478 meters (8,130 feet) on Dive 02 of the expedition. Notice its spiky, hair-like appendages. Image courtesy of the NOAA Office of Ocean Exploration and Research, Mountains in the Deep: Exploring the Central Pacific Basin. Download larger version (jpg, 1.9 MB). This holothurian, possibly from the family Synallactidae, was found on Dive 04 of the expedition at approximately 1,680 meters (5,510 feet). Here you can clearly see its mouth, a rare sighting as these are usually on the seafloor sucking up sediment. Image courtesy of the NOAA Office of Ocean Exploration and Research, Mountains in the Deep: Exploring the Central Pacific Basin. Download larger version (jpg, 1.7 MB). Two more holothurians (pictured below) from the family Synallactidae were also spotted but these were much more elongated with numerous dorsal papillae. These are also both likely from the genus Synallactes. Similar species are seen right across the Pacific deep ocean in the tropical Clarion-Clipperton Zone, showing that these species may have ocean-wide populations. 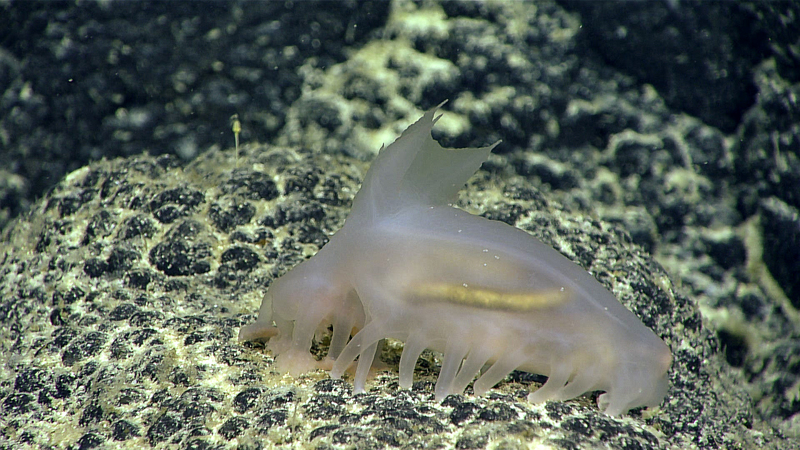 This holothurian from the Synallactidae family was spotted on "Whaley" Seamount at 1,040 meters (~3,410 feet) of depth. Image courtesy of the NOAA Office of Ocean Exploration and Research, Mountains in the Deep: Exploring the Central Pacific Basin. Download larger version (jpg, 1.3 MB). This holothurian is also from the family Synallactidae, likely from the genus Synallactes, and was seen at 1,930 meters at the site dubbed "Keli'ihananui." Image courtesy of the NOAA Office of Ocean Exploration and Research, Mountains in the Deep: Exploring the Central Pacific Basin. Download larger version (jpg, 1.6 MB). By far the two weirdest holothurians spotted so far (and probably in the entire deep ocean) were the rock-dwelling Psolidae and the pelagic Pelagothuria sp. 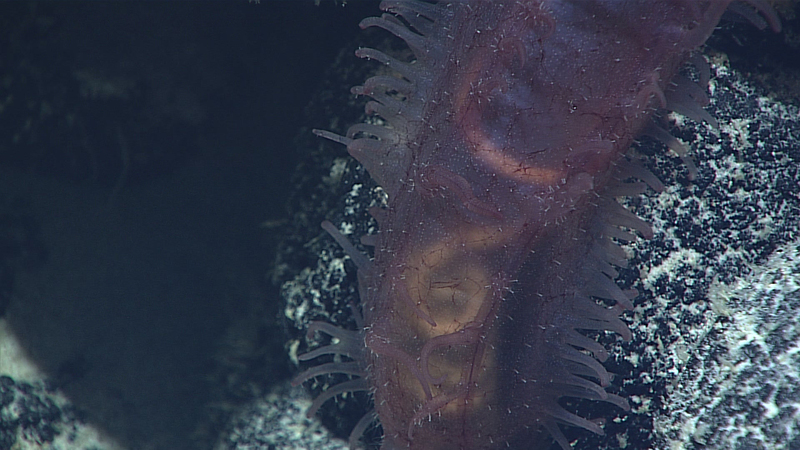 We sampled a Psolidae sea cucumber with our new scoop tool during Dive 05 of the expedition. These holothurians look more like anemones with tentacles extended into the water column and a sticky sole that allows them to attach hard substrate. A close-up image of the holothurian (family Psolidae) that we collected on Dive 05 of the expedition. The branching "tentacles" are modified podia used for feeding. Image courtesy of the NOAA Office of Ocean Exploration and Research, Mountains in the Deep: Exploring the Central Pacific Basin. Download larger version (jpg, 2.3 MB). The other uniquely modified and generally weird holothurian, spotted several times during the expedition, was Pelagothuria sp. (family Pelagothuriidae). This is a very poorly known species that is uniquely adapted to spend its entire life in the water column. They are also very unusual in appearance, resembling a jellyfish with large umbrella-like swimming structures. This sea cucumber was also spotted during the Discovering the Deep: Exploring Remote Pacific Marine Protected Areas expedition (watch the video here), indicating that they are widely occurring in the Pacific Ocean and much more common than we previously realized. Last but not least, we also saw an adorable sea cucumber from the family Elpidiidae (pictured below). While this looks very similar to sea pigs (Scotoplanes), this is more likely to be from one of the closely related genera, Amperima or Peniagone. 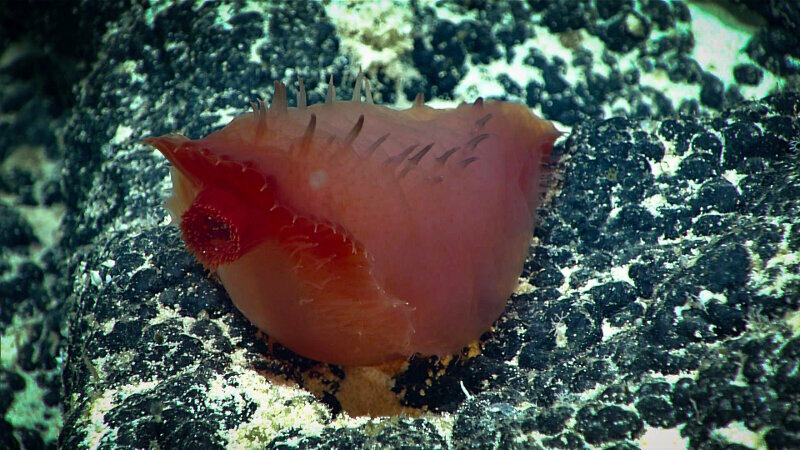 This species has very large podia for walking across the seafloor and a small velum (or sail) located on top its body. Cute elpidiid holothurian with an intestine full of sediment ~ 1,785 meters (~5,855 feet) found at the seamount dubbed "Keli‘ihanui." Image courtesy of the NOAA Office of Ocean Exploration and Research, Mountains in the Deep: Exploring the Central Pacific Basin. Download larger version (jpg, 1.6 MB). As you may have noticed, these holothurians have not been identified to a species. Instead, we can only identify them to genus or even family level. That is because getting positive identifications for holothurians can be challenging, as one needs specimens in hand, and sea cucumbers are extremely difficult to sample. 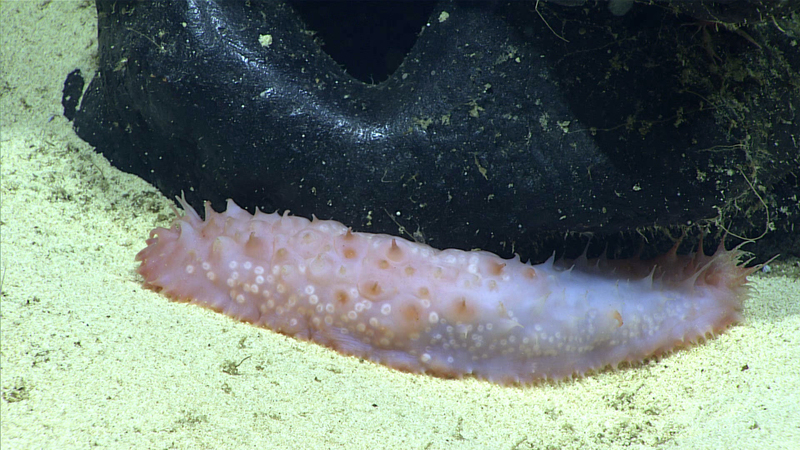 Sea cucumbers feel the same way they look – soft and squishy – therefore collections with a remotely operated vehicle manipulator arm is challenging. Sea cucumbers are generally identified first by the shape of their bodies and appendages (e.g., the presence of podia, feeding parts, shape, etc.). Upon collection, identification is based on the microscopic examination of ossicles (tiny internal skeletons) to determine the genus and the species. Molecular methods are also crucial, given the presence of cryptic species (individuals that look identical but are in fact completely different species genetically). Therefore, our visual identifications are only an estimate – but often a very good one! We hope that during the remaining dives of the Mountains in the Deep expedition, we continue to see many more of these sediment-munching denizens of the deep.